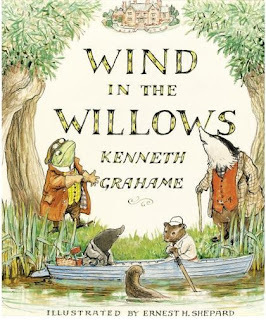 This book is written by British author Kenneth Grahame. Though published in 1908, this classic is still popular today, a true gem of literature. This story is about entertaining animal characters and their crazy, exciting adventures in the English countryside, whether its crashing motorcars, fleeing through the Wild Wood and accidentally finding Badger's underground home, or battling a group of weasels when they try to take their home. Kenneth Grahame has added beautiful descriptions, poetic writing and good messages hidden within. I would highly recommend this book to anyone who can read fairly advanced writing, as it has a few words that are no longer used in common English (e.g: gaoler instead of jailer). The book commences with the beginning of spring. The kind Mole gets fed up with spring cleaning his underground home and leaves it to go outside into the sunshine. He reaches a river, which he has never seen before. There, he meets Rat, a water vole, and the two become friends. Rat teaches Mole all about the river as they spend many days on the water. Later, they go to Toad Hall to visit Rat’s kind but conceited friend Toad. After seeing a motorcar, he is filled with an automobile obsession. Later, Mole strikes out alone into a forest known as the Wild Wood to meet the elusive Badger, an antisocial but kind friend of Rat who he has never met. He is scared by weasels in the Wild Wood, and hides in a tree. Later, Rat rescues his friend and they stumble into Badger’s house. After the two friends meet Badger, they inform him of Toad’s craze. They then return to the River. Meanwhile, Toad is arrested for stealing a motorcar and crashing it. He manages to escape prison and finds that Toad Hall is taken over by weasels and stoats from the Wild Wood. Sorrowful at the loss of his house, he realises what good friends he has and resolves to be better in the future. The four friends arm themselves and take a secret tunnel into Toad Hall, where they find weasels partying madly. They launch a surprise attack and storm the Hall. The weasels flee, and Toad regains his home. He then makes amends and helps everyone he has wronged. The four friends live happily ever after.